Queen Sonja of Norway (born Sonja Haraldsen on 4 July 1937) is the wife of King Harald V.
Sonja was born in 4 July 1937 at Red Cross Clinic in Oslo, the daughter of clothing merchant Karl August Haraldsen (1889–1959) and Dagny Ulrichsen (1896–1994). Her siblings were Haakon Haraldsen (1921–2016), Gry Henriksen (1924–1971) and Karl Herman Haraldsen (1929–1936, who died in a boating accident). She grew up at Tuengen Allé 1B in the district of Vinderen in Oslo and completed her lower secondary schooling in 1954. She received a diploma in dressmaking and tailoring at the Oslo Vocational School, and a diploma from École Professionnelle des Jeunes Filles (a finishing school) in Lausanne, Switzerland. There, she studied accounting, fashion design, and social science. She returned to Norway for further studies and received an undergraduate degree (French, English and Art History) from the University of Oslo. Sonja became engaged to then Crown Prince Harald in March 1968. They had been dating for nine years, although their relationship had been kept secret because she was a commoner. The Crown Prince made it clear to his father, King Olav V, that he would remain unmarried for life unless he could marry her. This would in effect have put an end to the rule of his family, and likely to the monarchy in Norway, as Harald was the sole heir to the throne. Faced with having to choose one of his relatives from the Danish Royal Family, the Dukes of Schleswig-Holstein or even the Grand Dukes of Oldenburg as his new heir in place of his son, Olav V consulted the government for advice and, as a result, the couple were wed on 29 August 1968, at Oslo Domkirke in Oslo. 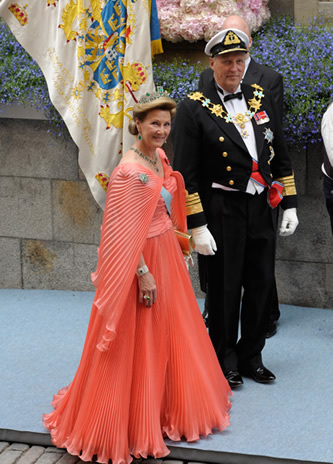 She thus acquired the style of Royal Highness and the title of Crown Princess of Norway. Prince Sverre Magnus, born 3 December 2005 at The National Hospital. In 1972 she was involved in establishing Princess Märtha Louise’s Fund, which provides assistance to disabled children in Norway. She has taken active part in large-scale initiatives to raise funds for international refugees and spent time in the 1970s visiting Vietnamese boat refugees in Malaysia. From 1987 to 1990, Crown Princess Sonja served as Vice President of the Norwegian Red Cross. She was responsible for the organisation’s international activities. She took part in a Red Cross delegation to Botswana and Zimbabwe in 1989. Sonja established the Queen Sonja International Music Competition in 1988. It was originally for pianists, but in 1995 the competition became only for singers. The jury consists of diverse authoritative figures in opera and the winners receive a cash amount and prestigious engagements at Norwegian music institutions. Following the death of King Olav V on 17 January 1991, Sonja became Norway's first queen consort in 53 years. 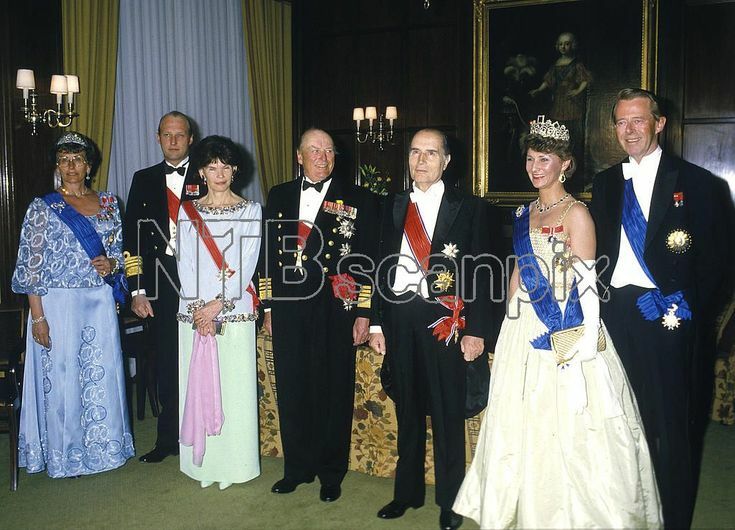 Queen Sonja accompanied King Harald V when he swore his oath to uphold the Constitution in the Storting on 21 January 1991. It was the first time in 69 years that a Norwegian queen had been present in the Storting. 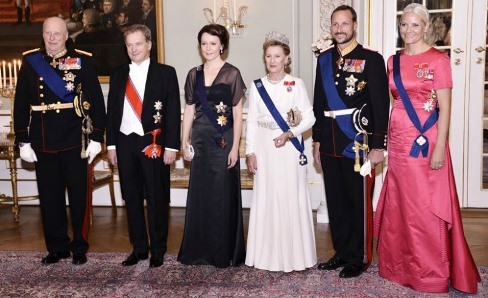 Since his accession, Queen Sonja has accompanied the King to the formal opening of the autumn session of the Storting and the reading of the Speech from the Throne. The Queen accompanies the King on official state visits abroad. She acts as the hostess when foreign heads of state officially visit Norway. 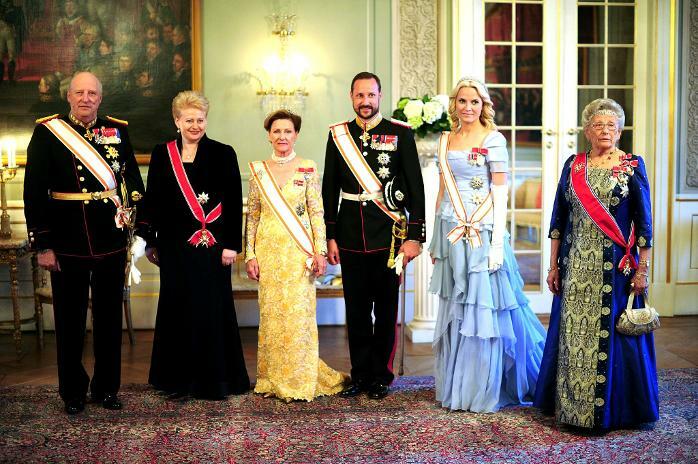 ^ a b c d e f g h i j k l m n o "The Official Website of the Royal House of Norway: Her Majesty Queen Sonja". ^ Karl August Haraldsen (b. April 5, 1889 in Solum, Skien, d. March 9, 1959 in Oslo) was a Norwegian clothing trader and department store manager. He was the son of a ship captain, Halvor Haraldsen (1854 - 1931) and wife Josefine Nielsen (1854 - 1939). He was the proprietor and manager of the renowned women's wear store Karl A. Haraldsen AS in Oslo. ^ Haakon Haraldsen (eldest brother of Queen Sonja) was the father of CEO Karl Otto Haraldsen, himself stepfather of TV personality Pia Haraldsen. ^ Dronning Sonjas bror, Haakon Haraldsen er død, 95 år gammel. Han gravlegges i Oslo fredag. ^ Gry Henriksen (elder sister of Queen Sonja) was the mother of Dag Swanstrøm, former CEO of Synnøve Finden. ^ Totl, Kjell Arne. "Kongehusekspert Kjell Arne Totland skriver: Gi kongeparet et permanent slottsmuseum". Aftenposten (in Norwegian Bokmål). Retrieved 2018-12-27. ^ Moxnes, Agnes (2018-12-27). "På tide med et slottsmuseum". NRK (in Norwegian Bokmål). Retrieved 2018-12-27. ^ a b "National Archives of Norway". Retrieved 21 August 2014. ^ "National Archives of Norway-listed as Joh. C. Ulrichsen". Retrieved 21 August 2014. ^ a b "Image of Grave Site". Retrieved 21 August 2014. ^ "National Archives of Norway-listed as Maja Ulrichsen". Retrieved 21 August 2014. ^ "National Archives of Norway". Retrieved 22 August 2014. ^ "National Archives of Norway-listed as Ulrich S. Ulrichsen". Retrieved 22 August 2014. ^ "National Archive of Norway". Retrieved 22 August 2014. ^ "Reply to a parliamentary question about the Decoration of Honour" (pdf) (in German). p. 518. Retrieved 28 November 2012. This page was last edited on 27 March 2019, at 17:35 (UTC).